Two weeks ago I presented a summary of policy positions for the major parties this Australian Federal Election. Since that time we have seen the release of Science and Technology Australia’s science policy questionnaire, the release of the Coalition’s costings and an official release from the ALP outlining their position on science and research policy. Of note is Tony Abbott’s promise to redirect $104 million of Australian Research Council funds away from projects deemed wasteful and into medical and health research. This should not be a surprise if you have been reading between the lines in the Coalition’s promise to maintain health funding and nothing more. The ARC’s competitive research budget for next year is $884 million and these cuts would “reprioritise” $16 million in the first year of a Coalition Government. 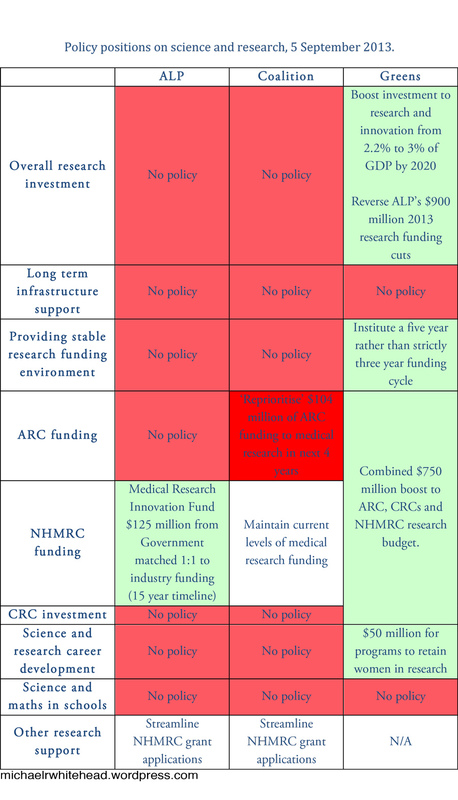 While this is not a great proportion of the ARC pie, the move is more worrying for the precedent it sets in letting politicians decide the national research agenda. Science and Technology’s response to the Coalition’s policy is here.